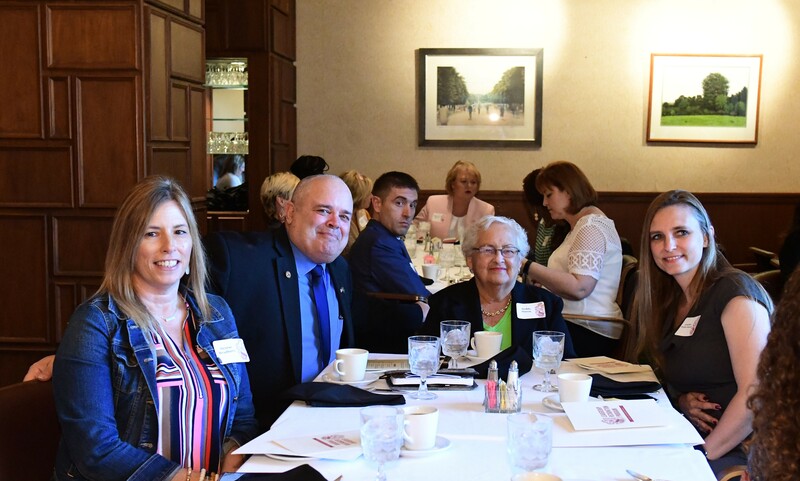 Denise Bradburn, Rep. Dan Swanson, Nedda Simon and Jennifer Russell at Women's Recognition Brunch at Sanagamo Club in Springfield on April 9, 2019. State Representative Dan Swanson welcomed area leaders Nedda Simon, Denise Bradburn and Jennifer Russell to Springfield on Tuesday for a women’s brunch that honored the contributions of emerging female leaders from throughout the state. Nedda Simon is an Emeritus Board Member and Founder of Freedom House in Princeton, an organization offering a safe haven for all women and their dependents while providing top-notch domestic violence and sexual assault services to our region. Denise Bradburn is the Executive Director of Discovery Depot Children’s Museum in Galesburg. Discovery Depot is a community-supported museum offering engaging, educational programming to children and families throughout the year. Jennifer Struble Russell is the Founder of Spotlight on Lyme QCA in Aledo. Jennifer founded Spotlight on Lyme QCA to help support people suffering from tick-borne illness and their families, bring awareness & education to our region about tick-borne illness. After the brunch and discussion group, the leaders were able to watch a portion of Tuesday’s legislative session from the House Gallery, where they were introduced and further honored by House Republican Leader Jim Durkin. The group finished the day with a tour of the State Capitol.